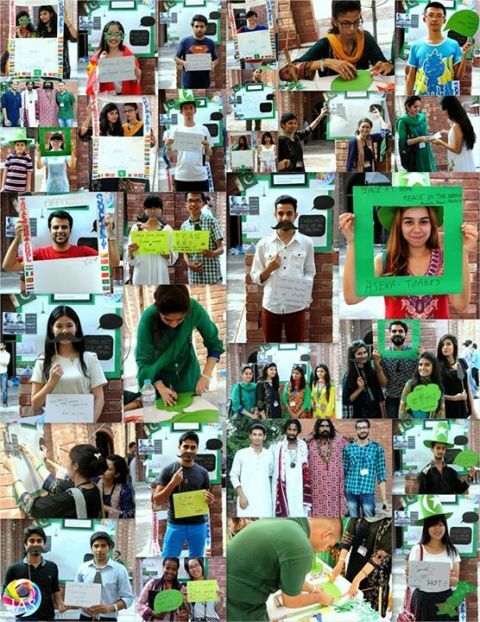 We feel extremely proud to announce that our campaign ‘Re-branding Pakistan’ for the Independence Day was very successful. Celebrations of Pakistan’s Independence Day have faded with time and so has the patriotic spirit of Pakistanis. People have complains and problems about the political instability, economic and social crisis, and increasing crime rate. Therefore, we as students of FCC and members of IAS, decided to revive that lost feeling again in a different yet interesting way through our campaign ‘Re-branding Pakistan’ which aimed at giving out positive messages for our country. As the big day came near, our inbox was flooded with messages and pictures. We received awesome messages from all over the world. Each and every message was so special and gave us an amazing feel about our beloved country. We collaborated with the largest student organization, AIESEC so that we could reach out a larger audience internationally. We also visited the Badshahi mosque and collected a number of messages from foreigners present there. This campaign gave us hope and every member of IAS is proud to have achieved this goal. We thank everyone who contributed to our campaig. Once again, Happy Independence Day. Pakistan Zindabad.